We have several events coming up on and around St Patrick’s Day. We hope you can join us! March 17, 10-10:30 – Yukon’s Birthday Bash on Main Street – We’ll bring a little Celtic flavor to their town birthday celebration in downtown Yukon! March 17, time TBA – Myriad Gardens – timing is up in the air due to the downtown parade, which ends at 12:30, but we will be performing sometime between 12 and 1:30 on the band shell. Come prepared for lots of family fun! Maddie and Cady spent some time competing in Colorado in the past month! Both girls competed at Elizabeth Celtic Festival, and Cady went back to compete at Snowmass. At Elizabeth, Maddie (novice) got third in Seann Triubhas and fourth in Fling, Swords, Lilt, Flora, and Reel while Cady (intermediate) got first in Hornpipe, second in Fling. Lilt, and Flora, and third in Seann Triubhas. Then at Snowmass Cady got first in Hornpipe and second in Seann Triubhas and Barracks! Pretty proud of how these girls have done this summer. Next up, our home competition, Scotfest! Although we’ve updated our Facebook regularly, we’ve been terrible at updating our blog! Here are a few photos from the first six months of this year. Highlights include Burns Night, Missy placing 6th in three dances at regionals (not pictured), and Maddie finishing her beginner year with two class trophies and a most promising beginner award! We’re excited about a few things in the coming months – Cady is back after having knee surgery, Elizabeth Celtic Festival in Colorado is coming up, and Scotfest is just 2.5 months away! This past weekend was a big one for Maddie and Cady at the Elizabeth Celtic Festival! At the Saturday competition, Cady placed first in all three Highland dances and Maddie placed first in Fling and Seann Triubhas and fourth in Swords. Each dancer took home their class’ trophy for the day! On Sunday Maddie took first in Lilt in the beginner class, while Cady placed first in Lilt and Flora and won the novice class trophy. They competed in their classes’ Special Trophy Fling, and both won! Congrats, ladies! Also check out this article from Elizabeth’s local newspaper. Cady was featured in a photo and a short interview! This January, the Ladymon School of Scottish Dance will be honoring the Bard himself, Robert Burns, at two Burns Night events! On Friday, January 22 we will be performing at United Scottish Clans of Oklahoma’s Burns Night at the Oklahoma History Center. This is the official kickoff for USCO’s thirtieth year as an organization and will be a night to remember! We’re especially excited that we’ll get to perform with our favorite piper, Bruce Robertson, and one of our favorite local bands, Ravens Three. If you’d like to purchase tickets, please visit unitedscotsok.com. 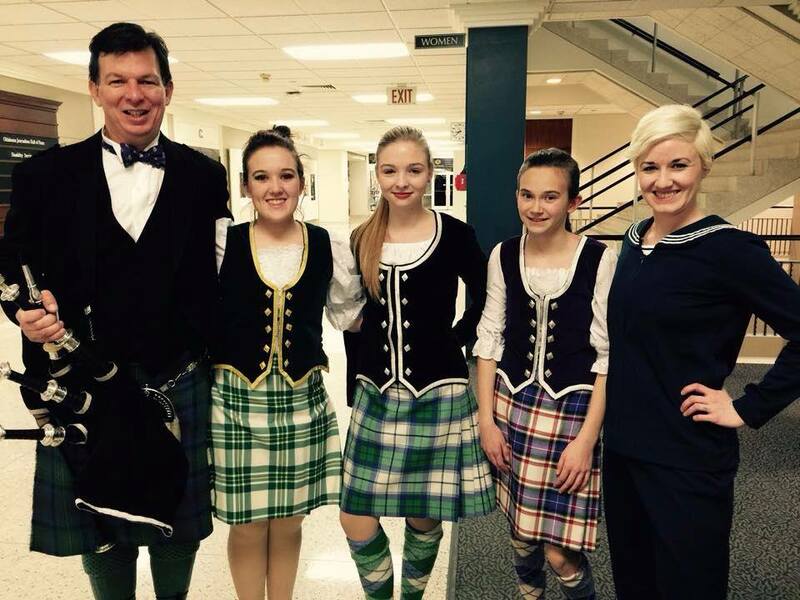 The following night, several of us will be in Tulsa to perform a few dances at the Scottish Club of Tulsa’s annual Burns Night at the German American Society of Tulsa. Also performing that night is Scotfest favorite Tullamore! If you’d like to purchase tickets, please visit tulsascots.com. It’s almost our favorite time of year again…SCOTFEST! Friday, September 18 through Sunday, September 20 River West Festival Park in Tulsa will transform into the Scottish Highlands. Join us as we perform on the dance stage and hop on the Scotrock stage with a few fantastic Celtic rock bands! We will perform on the dance stage (to the right of the entrance) at 11, 1, and 3 on Saturday and 12 and 2 on Sunday. This year we’ll have a record number of Highland dancers performing, and we’ve cooked up some great choreographies and new takes on old dances to share with you! Check out a few photos from our performances last year! We’re so proud of how well Cady and Maddie danced at the Elizabeth Celtic Festival in Colorado! Cady got first in Fling, third in Swords, and second in Seann Triubhas, Lilt, and Flora. Maddie got fourth in Fling, second in Swords, and fifth in Seann Triubhas! Congrats ladies!